Ich bin getauft, ich steh’ im Bunde, \ Durch meine Tauf’ mit meinem Gott! \ So sprech’ ich stets mit frohem Munde, \ in Kreuz, in Trübsal, Angst und Noth. \ Ich bin getauft! deß freu’ ich mich, \ Die Freude bleibt mir ewiglich. Ich bin getauft in deinem Namen, \ Gott Vater, Sohn und heiliger Geist! \ Ich bin gezählt zu Deinem Saamen, \ Zum Volk, das Dir geheiligt heißt. \ O! welch ein Glück ward dadurch mein, \ Herr, laß mich dessen würdig sein! Ich bin getauft ob ich gleich sterbe, \ Was schadet mir das kühle Grab? \ Ich weiß mein Vaterland und Erbe, \ Das ich bey Gott im Himmel hab: \ Nach meinem Tod ist mir bereit, \ Des Himmels Freud’ und Feyer=Kleid. Harrisbrug—Gedruckt und zu haben bey Moser u. Peters—1828. O! wer weiß, in welcher Stunde, \ Uns die letzte Stimme weckt; \ Denn Gott hat’s mit seinem Munde \ Keinem Menschen noch entdeckt! \ Wer sein Haus nun wohl bestellt \ Geht mit Freuden aus der Welt. \ Da die Sicherheit hingegen, \ Ewiges Sterben kann erregen. To these two married people, namely William Stober and his lawful wife Susanna, a born Fetterin, a little son was born into the world, the 24th day of December in the year of our Lord 1827. This son was born in Cocalico Township, in Lancaster County, in the state of Pennsylvania in North America, and was baptized and received the name Johannes Stober on the 1st day of June in the year of our Lord 1828 from Mr. Leinbach. Sponsors were Johannes Stober and his wife Elisabeth. I am baptized, I stand united with my God through my baptism. I therefore always speak joyfully in hardship, sadness, fear and need. I am baptized, that’s a joy for me. The joy lasts eternally. I am baptized in your name, God, Father, Son and Holy Ghost. I am counted as one of your seeds, to a people that you blessed. O! What fortune for me; Lord, let me be worthy of it! I am baptized! and when I die, how can the cool grave hurt me? I know my fatherland and legacy that I will have with God in Heaven. After death, Heaven’s garment of joy and celebration is prepared for me. Printed and to be had from G. S. Peters, Harrisburg, Pa. Writing by me, Wm. H. Stober, November the 28th 1828. This Johannes was born in the morning at half past four in the sign of Pisces, 1827.
our strength diminishes, and with every year we grow more ripe for the bier. And who knows in what hour the final voice will awaken us, because God has not revealed this to anybody yet. Who tends to his house will depart from the world with joy. Because surety, in contrast, can provoke eternal death. Hand-lettered, printed form; color printing. The central text printed in Fraktur with blanks infilled by hand is in a decorated rectangular frame in the center of the document. A basket with flowers and one of the verses are below it. Two verses are in frames in the upper corners. 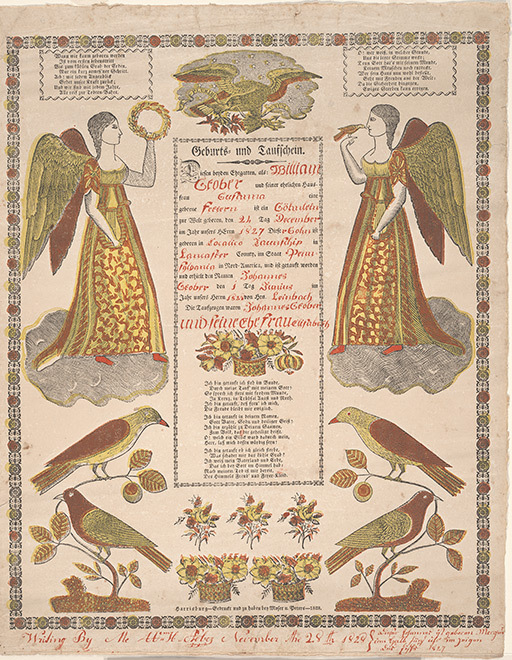 The main text is flanked by two large inward-facing angels with lyres, one holding a wreath and the other with a bird. A spread-winged eagle with a banner in its beak is in the upper center. In each lower corner are two birds perched on a tree with leaves and fruits. Between them are two baskets with flowers as well as three bunches of flowers. The entire page is enclosed in a decorative border. Klaus Stopp, The Printed Birth and Baptismal Certificates of the German Americans (East Berlin, Pa.: Russell D. Earnest Associates, 1998) vol. 3, p. 47.